Girls blue star necklace makes an auspicious gift for your little ones. 6mm turquoise blue glass pearl beads, mother of pearl star beads, blue abacus crystals, and Tibet silver spacers are combined together for a cute little girl's stylish look. The necklace is strung onto tigers tail wire for strength, durability and drape. Finished off with a large lobster clasp and a charm dangle chain extension allowing small length adjustment. The Girls blue star necklace is approximately 16 inches long including the clasp and jump ring. The chain extension is 2 inches long. 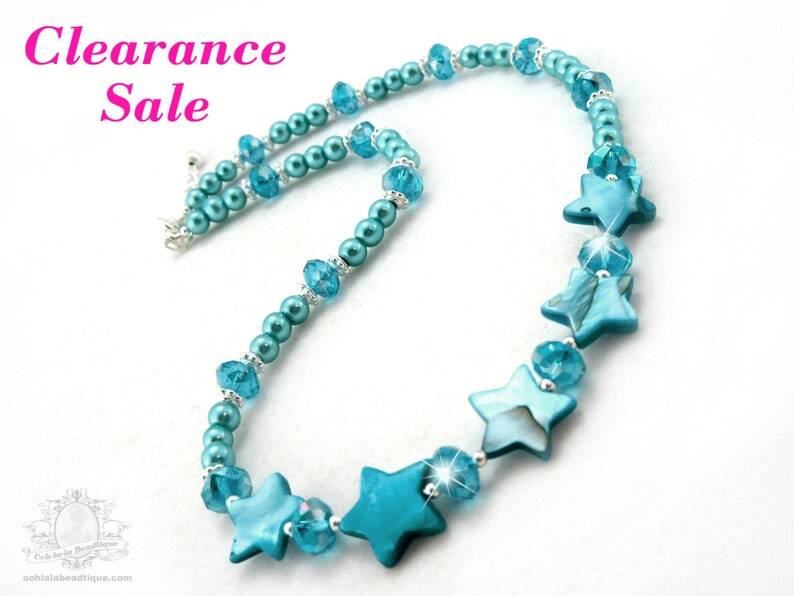 The Girls blue star necklace is a Clearance Sale item. The string the necklace is strung onto has a slight kink from prolong storage. Overall the Girls blue star necklace is in great condition and can accessorize beautifully any wardrobe. All sales are final, there are no returns or exchanges. Sale items (length, or color) can not be customized, and are sold as is. Many Ooh-la-la Beadtique handmade products are crafted using natural components such as semiprecious stones, freshwater pearls, and wood. No two materials in nature are alike. The handmade Girls blue star necklace that you will receive may slightly vary in shade and texture pattern from the picture listing. Also note, that all monitors and computer screens are calibrated differently. The same product may appear in diverse colors on different monitors.